| That’s what sets us apart. 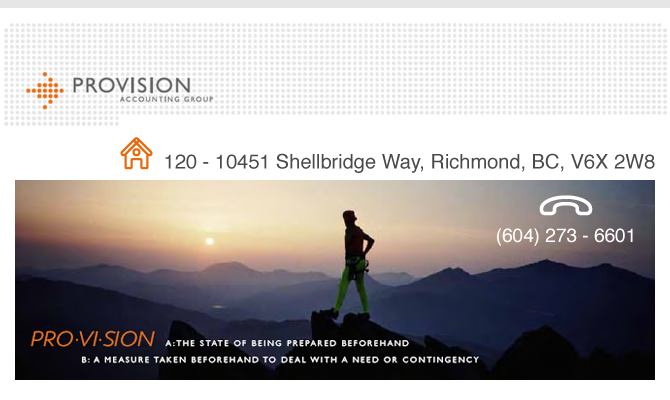 At Provision we take the time to fully understand every aspect of your financial needs. We work in tandem with all your advisors – financial, insurance, estate planning – to ensure maximum cash flow in both the short and long term. Most importantly, we look to the future, anticipating potential problems and possible opportunities to ensure you are always fully prepared. This integrated long-term approach, combined with our professional expertise and diligent follow-up of personal and corporate requirements throughout the year, means that you will have no surprises at tax time. | Service makes the difference. Peace of mind comes from being fully informed and getting prompt attention. You can trust us to respond in a timely manner, set and meet realistic deadlines, and review your finances with a meticulous attention to detail. Everyone at Provision shares this commitment to old-fashioned value, long-term relationships and exceptional service.